“The Case of the Mysterious Zita Makara” continues in these issues of the private eye series by Dave Ebersole and Delia Gable. Unfortunately, they illustrate that my expectations for the book vary from those of the creators. Nothing wrong with that, but I was fascinated by putting a traditional noir detective who happened to be gay into the conventions of the genre. Here, instead, we get a horror overlay, as issue #2 introduces a soul-sucking spirit vampire-type monster. I perhaps should have expected that we’d see something like this, given the Egyptian background of the titular femme fatale, but it goes in a different direction than I hoped for. Dashell Malone is struggling with conflict both internal and external. His lover Plink has been murdered, and while he copes with his tarnished grief, he’s also been questioned by the police about the killing. Battling it out with a biased cop in issue #2 helps him channel his feelings into action, although it probably doesn’t do his long-term career any good. As we learn from a key flashback about Dash’s past, though, that ship sailed a while ago. The voices of the characters are crisp and distinctive, while the art is full of emotion and attitude under a period veneer populated by the expected items — the police station at night, the descent into a whiskey bottle in the deserted detective office, and so on. There’s also a brief lesson on Egyptian symbology and the Ouroboros. I got a chance to see a preview copy of issue #3, which is currently listed for preorder. 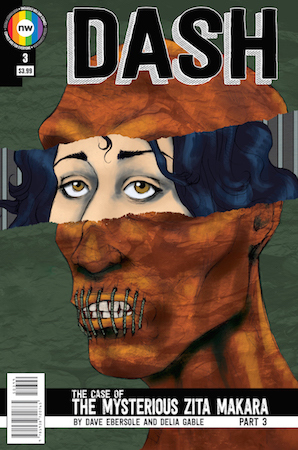 It’s due out at the end of May, and it can be ordered through your comic shop with Diamond code MAR15 1437. 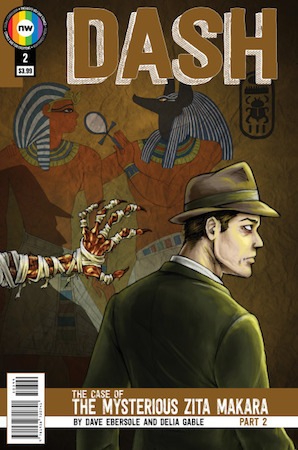 In this issue, as indicated by the cover, the mummy shows up. Also, a possessed-looking Zita fights Dash in the museum, during which he finds out that he’s “destined to die”. (As threats go, this isn’t particularly scary, since aren’t we all?) That’s the main source of action this issue, since after the struggle, there’s a lot of conversation about its ramifications. There’s a new woman, the perky blonde Miss Butterback, who is a lot more than she pretends to be (another classic character type, welcome to see). Plus, Dash is dragged back to the police station for a new revelation and a coming threat. Regardless of my choices regarding plot elements, I’d like to find out more about what happens with the cast, particularly Dash and his spunky secretary Cindy. I found it a help to read both issues together, since that reminded me what the object was that Dash was examining in his office. That’s a problem with trying to plot a mystery that comes out in serialized fashion — you don’t want to keep telling readers things they already know, but with months between installments, you do need a certain amount of memory-jogging.